The government shutdown ended — at least temporarily — so the two sides could negotiate on border security. It’s nonsense, of course. Pelosi and Co. has made it abundantly clear before, during and since the shutdown: There will be no border wall funding, period. This isn’t rocket science. The media have always covered shutdowns in the same exact way. It is always the fault of conservatives hell-bent on national chaos, affording the elites to expand their wealth and power at the expense of the poor and downtrodden, etc., etc., etc. They will argue that shutdowns for any reason are an absolute fool’s errand for Republicans. The national “news” media will deliver a daily grind of GOP-caused mayhem, stories about lapsing security at airports; government employees going broke and attempting suicide, or having to sell their plasma or ration their insulin because President Trump was so obstinate. And never mind that by law, every single penny lost during a shutdown will be paid to federal workers as soon as it’s over, making the shutdown a nice vacation for the suffering lot. 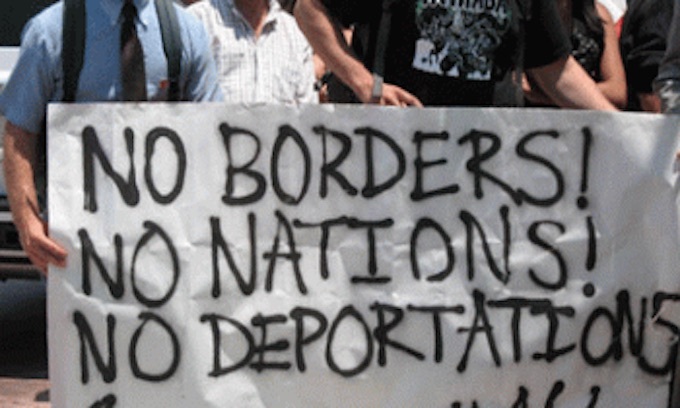 You have to love the idiocy of the people who made that sign… No Borders, No Nations… Who exactly do they think is going to pay for all the give-aways if Leftists don’t have a Nation to tax and control? Even better, who do they think is going to protect them if the Nation no longer exists and they’ve bought into the Leftists ideology that they don’t need guns? And who’s FUNDING THESE morons, making their signs etc? What nation do THEY COME from, and would those nations even LET THEM protest like this?